How does your firm measure up? That is the vital question many architectural and engineering (AE) firms should be asking themselves. It is challenging to manage what you are unable to measure! There are several key performance metrics that an AE firm should use to determine its current status. These measurements are important to not only keep you abreast of the condition of your company, but they also allow you to examine the past, so you can plan for the future. Let’s look at a few of the significant performance metrics. A win rate offers insight into which business development endeavors are working. A minimal improvement in your win rate can make a crucial difference in your profitability. Win rates will aid in determining the chances of sealing a deal. The capability of your company to gain new business is critical to your success. Profit is one of the most important metrics in ascertaining the success of any company. Profitability metrics help AE firms determine if they are actively engaging suitable businesses. Profit is the measurement of gross income deducting all expenses. The labor utilization metric helps evaluate acceptable staffing levels. This metric offers insight into the performance of all employees, identifying which employees are under performing and which are over performing. To maintain an effective labor utilization rate, management should spend time reviewing both direct and indirect portions of the metric. Net revenue is the force that keeps a business thriving while the operating income is a measure of business capacity. This measurement determines the amount of income that a firm passes along to subcontractors for their services versus the amount that they keep for their own services. It is a noteworthy metric. To measure whether you are operating within your budget and track the remaining work your firm has, the backlog analytic is very helpful. For this metric to be effective, it is important to include both the proposals you hope to win as well as the current work that remains. This will allow your firm to get an accurate picture of your ongoing work and budget needs. For any business to grow and continue to be successful, client loyalty is a necessity. It is important for both word of mouth referrals and repeat business. Meeting client expectations, proactively engaging in client feedback and acting on areas that need improvement are all essential to keep loyalty. Company growth is often the result of new business. There is almost always a cost involved with obtaining new business such as labor and materials. Measuring these costs aids in selecting which new businesses to go after and if the potential gain will outweigh the cost. Continuously measuring and monitoring key performance metrics on a regular basis is vital to the continued success of your AE Firm. While we have discussed some notable ones, there are endless measurable metrics for your firm. 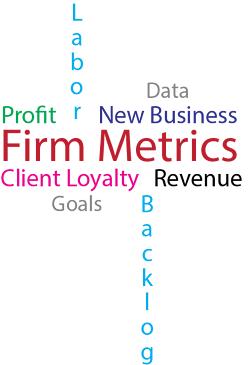 It is up to you to determine which metrics would most benefit your particular firm. However, make sure both staff and management have a clear understanding of the chosen company metrics and your goals.